Grace Whispers: The Law and sin punish, but I discipline those I love. Discipline is never pleasant for the moment but if you embrace it, it will bring forth fruit of righteousness. My new book, “My Return Home to Innocence,” (found on Amazon), Chapter 16 entitled, “Law Glasses Cleaned.” This chapter reveals how I was indoctrinated under the law of fear and punishment; it was difficult to receive our Father’s love unless it came in a certain package. In the denomination which I was saved, women weren’t allowed to wear pants, make-up, open-toed shoes, or jewelry. We loved the Lord, but we were so focused on the outer man which left our inner man shackled and unable to be free to be whom we really were In Christ. We were very sincere in our dedication to the Lord, but we didn’t understand that trying to follow laws and rules in the Old and New Testament kept us bound and unable to experience His grace and love only found in the Law of Grace in the New Testament. We were bound by fear of punishment rather than bound by the discipline of His love. The Lord cleaned my law glasses when He came in the disguise of a woman in pants and red lipstick who prayed for me when I was broken and hurting. She restored my soul to life! 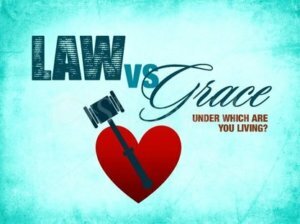 The letter of the law, always brings fear of punishment, whereas, the law of Grace brings freedom and life. Let me share a story to shed light on the subject. There was a little girl named Rula, who grew up with a father she believed loved her. He was very strict and had lots of rules to keep her behavior in line. Rula tried desperately to please Him by obeying everything he told her to do; she was afraid of his rejection and failure. When she went to school, her teachers adored her because she did everything they told her and got ‘As’ on all of her report cards. There was another little girl named Grace, who grew up with a father who loved her and she knew it. He was kind, gentle, patient, and forgiving; he had rules, but his rules were used to keep her safe and protected from danger, but never to cause fear. This little girl didn’t always get ‘As,’ but she did her best in whatever tasks given her. She loved to please her father, not because of fear but because of the love he showed and had for her; she was never afraid to fail. The first father was mine for years. I reacted and responded to Him because of fear; I hid my failures, weaknesses, and sins. I pretended to be someone I wasn’t. I wore the spiritual mask for years. I built my life around How Much; how much time I spent reading the Bible, praying, ministering to others, witnessing, memorizing scriptures, fasting, being used by God in ministry, and more trying to be accepted and make him proud. And when I couldn’t measure up to what I thought I should be or others’ expectations, I felt like a big failure, lost, and alone. 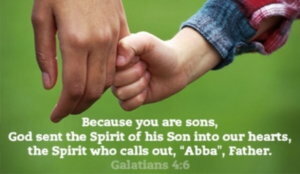 But one day, I met the Father of Grace (my ABBA, my Papa). He was the one who helped me take off my spiritual mask, and I learned to share my heart with, be honest with, and to let him see all of my sin, struggles, and failures. He was the Father I fell in love with; HE IS MINE AND I AM HIS FOREVER MORE! If the Law is your father, he tells you who you ARE NOT and what you MUST do to become. He can never provide an intimate relationship with you, no matter how hard you try.